•	The first observation from the comparison is that this is the first year the company is reporting Year-on-Year positive earnings since 2015. •	The company has offered to pay a cash dividend of three kobo, despite its negative Retained Earnings of N1.921 billion. 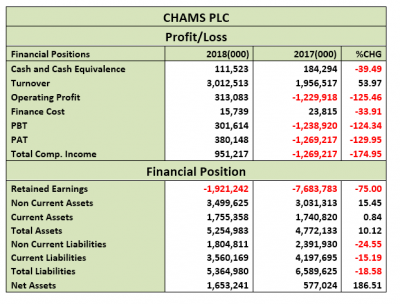 •	Nevertheless, the cash dividend reported is same as 37.06% of the amount reported as profit for the year under review, which means that 62.94% of the said earnings will help reduce the negative retained earnings. •	We also noticed a significant reduction in the amount reported as Administrative Expenses for the year from the previous N2.102 billion to N1.311 billion. This represents a 37.62% cut from the 2017 expenses. •	Turnover for the year smartly improved by 53.97% and is currently estimated at N3.102 billion, compared to the N1.956 billion achieved in 2017. •	Nevertheless, the business is seemingly characterized by high Cost of Sales, which however dropped, leaving Gross Profit at N785.534 million, almost same as the N742.993 million reported in 2017 financial year. •	As noted above, the company reported Other Operating Income of N838.978 million, as against the N129.516 million earned in 2017. •	Thus, Operating Profit for the year stood at N313.083 million as against the N1.229 billion loss reported at the end of 2017 business. •	Also notable is the reduction achieved in the Finance Expenses down to N15.739 million compared to N23.815 million in 2017. •	Thus, it had reported a Profit before Tax (PBT) of N301.614 million as against the Loss before Tax of N1.238 billion reported in 2017. •	Having reported a Positive Tax Expense of N78.534 million for the year as against the negative N30.297 million in 2017. •	To bring down the negative Retained Earnings, N5.423 billion was transferred from the Share Premium Account and N338.799 million from Income Statement. This two items reduced the negative Retained Earnings Figure from N7.683 billion to N1.921 billion. •	Non-Current Assets Improved by 15.45% to N3.499 billion as against N3.031 billion in 2017. •	Current Assets increased marginally by 0.84% to N1.755 billion, as against N1.740 billion in 2017. •	At N1.804 billion, Non-Current Liabilities stood below the N2.391 billion reported in 2017 by 24.55%. •	Current Liabilities equally reduced by 15.19% to stand at N3.560 billion, as against N4.197 billion. •	Thus, Net Assets is valued higher for the year at N1.653 billion compared to the N577.024 million valued at the end of 2017 financial activities. •	Total Debt to Equity Ratio is currently estimated at 3.25x. That means, Total Liabilities can replicate Equity more than three times, which is not in favour of investors. Nevertheless, the ratio is quite less than the industry average. •	Meanwhile, the estimated current ratio is below unity at 0.49x as against the industry average of 3.19x, which theoretically implies that the company may not be able to swiftly service its current liabilities as and when due. 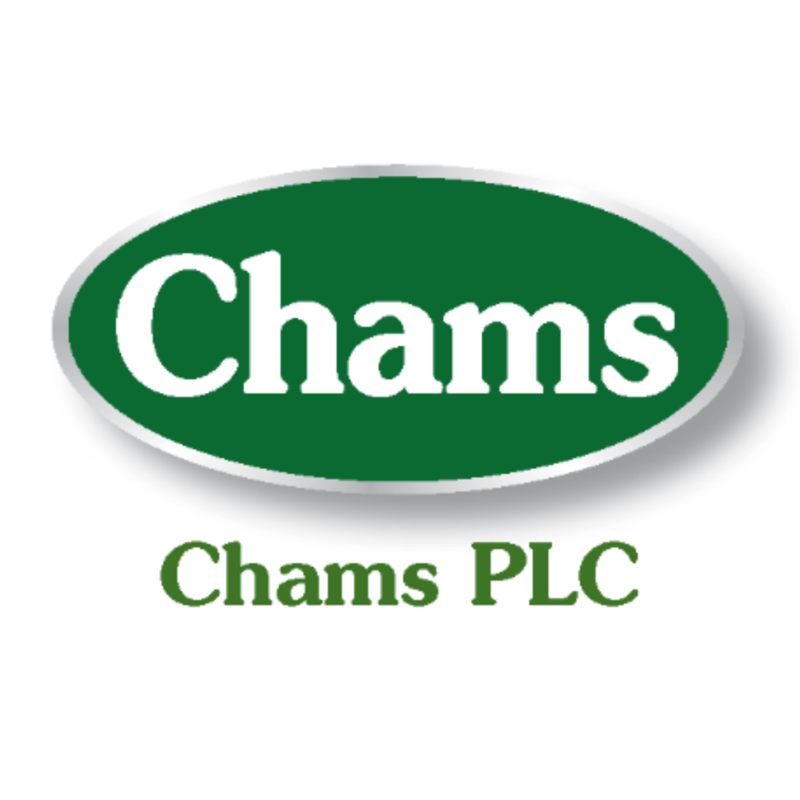 •	Meanwhile, at a Beta value of 0.01 Chams Plc’s shares is far less patronized by the investing public, which means very low trading in its equities. •	Cost of Sales Margin is currently estimated at 76.92%, which is 19.19% above the 62.02% estimated last year. •	Profit before Tax margin is the same as 10.01%, as against the negative PBT margin of 2017. •	The amount reported as Profit for the period for the year is 12.62% of the Turnover. That means Profit Margin is 12.62% as against a negative estimate of last year. •	Return on Average equity is currently estimated at 22.99%, compared to the negative ratio of 2017. •	Return achieved on Average Assets is now 7.23%. •	Testing the management efficiency, when the Asset Turnover was gauged, the ratio improved by 39.83% from 41.00% to 57.33%. •	Also tested was the Equity Turnover, currently at 182.22% as against the 339.07% estimated in 2017. This is because, in the current year, both Turnover Figure and Equity appreciated, unlike 2017 when Equity was low. •	In other words, the equity was multiplied 3.18 times through the 2018 financial activities slightly above 8.27 times in 2017. •	See below for further efficiency ratios. •	Estimated Earnings per shares for the year is N0.08, as against the Loss per share of N0.27 estimated in 2017. •	P/E Ratio equally turned positive to 2.47x. •	Price to Book Value revealed an Under Priced state at below unity. •	Book Value revealed the true picture of the Under Priced nature, showing that it is currently estimated at N0.35, better than the N0.12 estimated in 2017. Please understand that the improvement achieved in the Equity Value in the current year is responsible for the improvement. •	With the appreciable adjustment done on the Operating Expenses during the current year, Operating Expenses is only 43.53% of the TO value, unlike last year when it was slightly above turnover value. 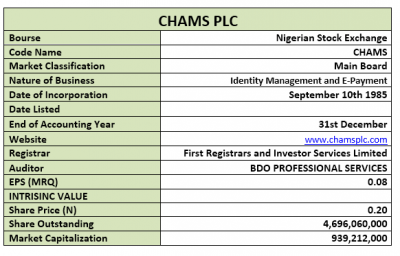 •	Exploring our blend of Valuation Models to place a value on each unit of ChamsPlc shares, we arrived at N1.23 each. Nevertheless, there are various things to be considered while relying on this valuation. 	Thus, the question which then arises is: will the company be able to build on this performance and improve the dividend payout next year, or at least pay the same? 	In our opinion, it is better to see a consistent trend in financial performance indices through the next financial year, before working towards the above valuation. (please note that we intentionally excluded the valuation in our intro from the beginning of the right up, expecting those who read up to this Valuation Analysis to understand our true stand). 	On the strength of the above, we have rated the Equity a WATCH.